South Korea is a country in East Asia located on the Korean Peninsula. The country’s official name is the Republic of Korea. In 1945, Korea, which had been a single nation until then, was divided into two parts. One of them, the Democratic People’s Republic of Korea, is located north of the 38th parallel, and the other, the Republic of Korea, is to the south of it. This is why it has come to be called South Korea. Korea is surrounded by seas on three sides. To the south is the East China Sea, to the west is the Yellow Sea, and to the east is the Sea of Japan. Most of the country is covered by mountains, although there are no active volcanoes. South Korea is famous for its cuisine, the martial art Taekwondo, pop culture (popular Korean music artists are called “idols”), and eSports. It is probably the only country in the world where StarCraft champions are just as popular as professional soccer and basketball players. South Korean college students are some of the best in the world. The country has managed to achieve this thanks to its system of supplementary education schools that teach not only academic disciplines, but also martial arts, dance, and etiquette. Because of this system, some teachers make as much as several million dollars a year, and students do their utmost to study with the best teachers. Korean students apply to institutions of higher learning after passing a unified examination (somewhat like the SAT). Students who don’t do well enough on the exam lose all hope of enrolling in prestigious universities. Unfortunately, this intense pressure has led to a high suicide rate among students. 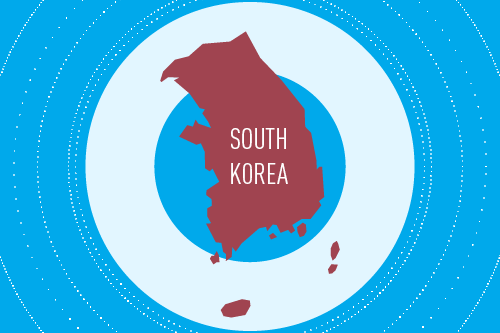 South Koreans generally have a favorable view of their financial situation. Only 27% of them believe that they don’t make enough money. However, 41.8% believe that they earn a high wage. Moreover, South Korea is considered to be a country that successfully fought corruption and red tape — you can start a business there in just four days. By comparison, it takes six days in the US and eleven days in Germany. Interestingly, South Korea has the fastest Internet speeds in the world. The average Internet speed there is 28.6 Mb/sec. By comparison, these numbers were 1.5 times lower in the US in 2017. Average Internet speed in the US is 18.7 Mb/sec. According to data from Statista, the total size of the South Korean video game market was 2.187 billion USD in 2017. 69% of all revenue was from mobile projects. It is one of the largest video game markets in Asia. These numbers are largely due to the high level of smartphone penetration in South Korea. The country’s mobile market made a profit of 1.515 billion USD in 2017. The market is currently growing, and, according to experts, it should increase by 6.2% per year between 2016 and 2022. However, analysts predict market saturation by 2022, after which the market will shrink. In 2017, 17.5 million South Koreans played mobile games — that’s 34% of the population. 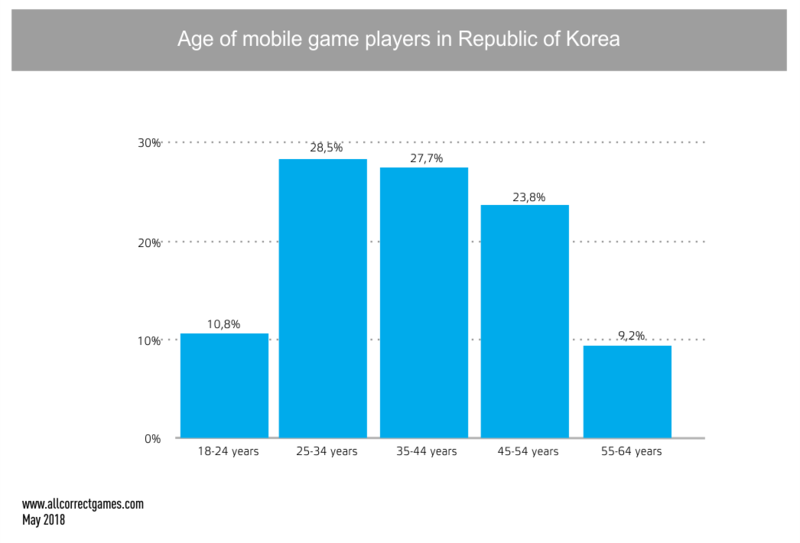 By 2022, 26 million South Koreans, or 49.6% of the population, will be playing games on their smartphones. Despite the fact that more and more people are starting to play mobile games, analysts predict a negative market dynamic as 2022 approaches. This is due to the fact that South Koreans will probably be making fewer in-game purchases by then. In 2017, the ARPU (average revenue per user) from mobile games was 86.68 USD, which is comparable to Japan, the leader in this regard. 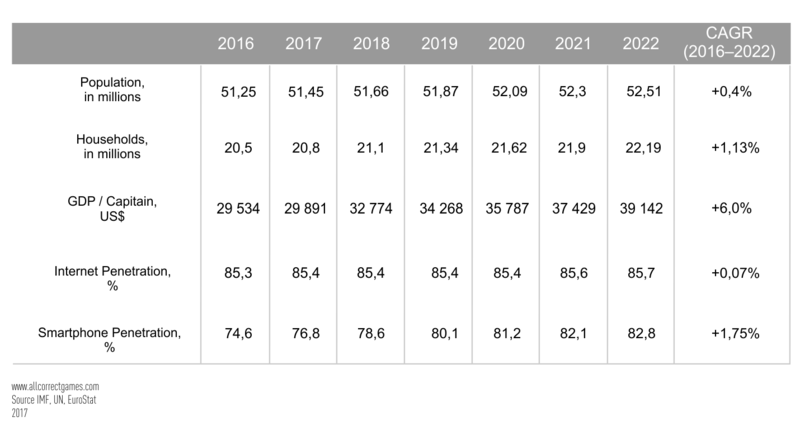 By 2022, ARPU will drop to 68.55 USD. Experts believe that this could be linked to intense competition from AAA online games. The ARPU from these games is predicted to climb from 69.09 USD in 2017 to 80.49 USD in 2022. 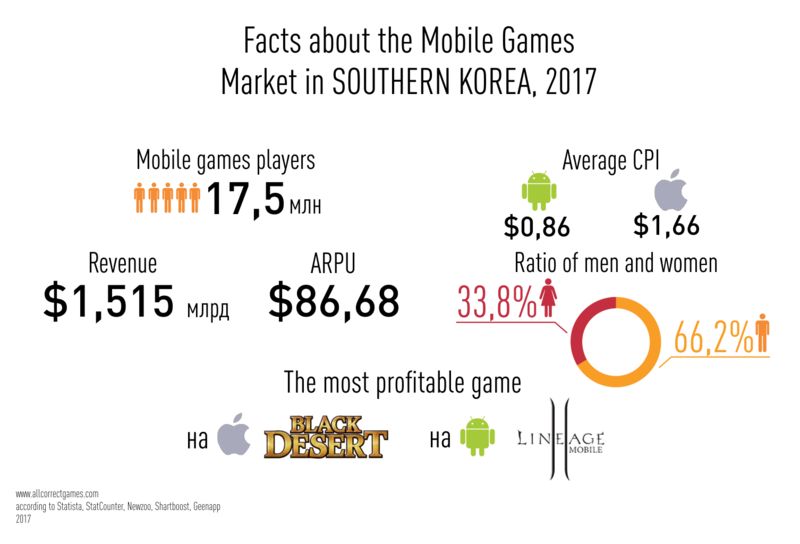 However, despite this negative dynamic, in 2022 South Korean gamers will still be putting a comparatively large amount of money into mobile games — the average ARPU worldwide is 30.64 USD. It’s also noteworthy that the cost of attracting customers is relatively low in South Korea. According to data from Chartboost, one iOS user costs 1.66 USD, and one Android user costs 0.86 USD. However, such low cost is linked to the quality. 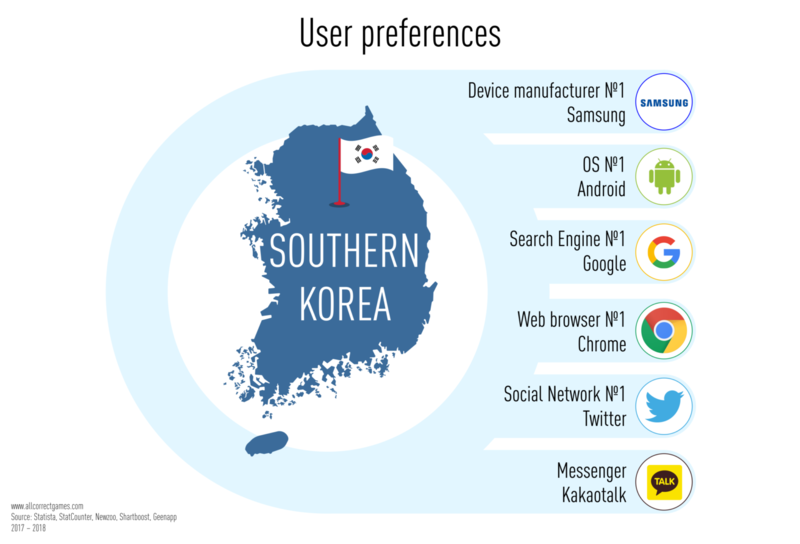 South Korean users pay well, but they switch applications frequently. 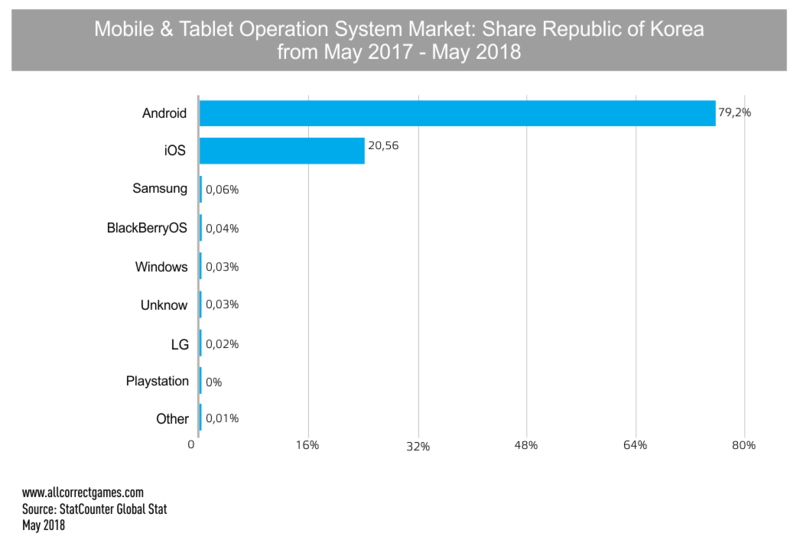 Google’s operating system is dominant in the South Korean market. According to StatCounter, 79.2% of the market is on Android devices. 20.56% of users own iOS devices. The most visited websites in the country are Facebook, Twitter, and Pinterest, with YouTube coming in fourth. When it comes to messengers, South Korean users prefer KakaoTalk. The most popular smartphone brand in South Korea is Samsung, which has a market share of 56.44%. The second most popular brand is Apple (27.24%), and the third is LG (12.7%). The main search engine is Google, which has a market share of 93%. The next most popular are Baidu with 2.3% and Bing with 1.5%. Interestingly, the fourth most popular search engine is Russian Yandex, which has the same market share as Bing: 1.5%. Who Plays Mobile Games in South Korea? Male gamers significantly outnumber their female counterparts in South Korea: 66.2% of all gamers are male, and females are almost half of that: 33.8%. Most gamers are 25–34 years old. 28.5% of all gamers belong to this segment. But older people like playing games too: 27.7% of all gamers are 35–44. South Koreans are especially fond of RPGs. Over 50% of the games on the top ten list are RPGs. European users might be surprised to see that two different Lineage games are on the list: the mobile version of Lineage and Lineage II: Revolution. These games were released by different companies. Lineage Mobile is published by NCSoft, and Lineage II: Revolution is published by Netmarble. ents back as in-game currency. Moreover, many games can be played in the application without loading. For developers: integrating your project with KakaoTalk is a great way to get a large amount of organic traffic. This channel can be viewed as a way to enhance your marketing presence in the region. The South Korean parliament passed amendments related to the video game industry on June 21, 2017. Now anyone who creates and disseminates third-party programs prohibited by game developers will be subject to fines or imprisonment. This gives developers legal tools that they can use to combat hackers and cheaters. The penalty for violating this new law is a 50,000 USD fine or a prison term of up to five years. In addition, on June 14, 2017, a bill that would also create legal penalties for boosting (leveling up other players’ game accounts for money) began to be discussed. Anyone caught boosting would face a fine of 18,000 USD or two years in jail. The payment system market in South Korea is strictly regulated through legislation and bureaucratic institutions. 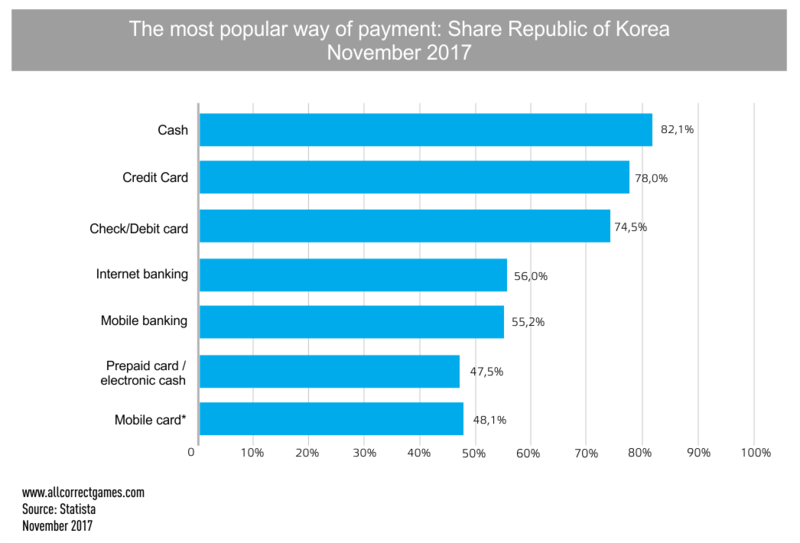 Credit cards have a market share of 58% (according to Statista data from November 2017) and are the most popular payment method in South Korea. The remaining 42% of the market use alternative payment methods. South Koreans prefer credit cards because they are easy to use. Credit card payments are easy to track, card users receive discounts, and taxes on credit card payments are reduced. Only 0.7% of all payments are made using mobile services according to Statista, which bases its information on data from the Bank of Korea. This has been confirmed by studies on preferred payment methods. These studies show that cash remains the most convenient form of payment for many South Koreans. Cards with their familiar, convenient format come next. Mobile payments (where the card is linked to a cell phone) have achieved almost no popularity among the population. South Korean developers are also popular outside of their home country, but this applies mostly to AAA projects rather than mobile games. The only games to become at all popular in the West are probably Lineage II: Revolution and Seven Knights, which currently have over ten million installs. Western developers feel quite restricted in the South Korean market. There isn’t a single Western developer on the F2P charts, and only one game has made it into the list of the top ten games in the premium segment: Mojang’s Minecraft. However, in all fairness we should point out that Minecraft is actually the most popular paid game on mobile devices in South Korea. Korean is a language isolate spoken by around 60 million people. Modern Korean has six dialects: central, northeastern, southeastern, southwestern and the dialect spoken on Jeju island. With the exception of the latter, all of the dialects are relatively similar and are mutually intelligible. Different styles of speech are used depending on social position and age, as well as the topic of conversation. During translation, it is essential to bear in mind that Korean has numerous synonyms for any given word.